Not an easy sm but not entirely hard to clear with 0 diamond. 7a) Grind through, until he explodes 6 hearts. At that point, try to burst with ML convert, Maya, Zhen Fu + DC. At the very least, you'll avoid dying for one round. If you think you can take him down then Luna, otherwise just keep grinding through and hopefully he'll eventually die. Saw this team on my leaderboard, and used it to clear light achievements. I recommend it if you want to clear light achievement but don't have Maya/TSZ. Or maybe if you have Maya but want something more stable? Any damage boosting DC should be ok. Lyra could be replaced with the PR Light Valkyrie? The recovery will be better, but the attack multiplier will be lower, so watch out. I guess Virgo could also work, but the attack multiplier is even lower, so I'm not sure. Lyra doesn't have to be max skill, but it's safer to have her at a low CD since light rune healing is only 25%, and it helps when grinding on some of the earlier stages like R5a. Remember you need to dissolve two types of Light/Dark/Heart for Maya to give you a multiplier. R5b: Keep grinding by dissolving dark runes until everything is up again. Maya + ML + ML convert + Luna to kill. R6: 1 non-light combo to get rid of Luna and grind. When you're almost done, turn on PR Yan and dissolve all hearts. R7a: Grind using light runes to heal. Use Lyra if HP is getting low (make sure to dissolve all hearts). When they come up, use ML convert + Maya to knock off ~100k HP. (Again, remember to do 3 or 4 rune groups, so you don't get any skydrops). Once you are <100k HP to finishing off the boss, use Luna + ML convert + Maya. Hopefully you'll kill and Luna will carry over to the next round. R7b: Colin, divide up the dark runes with Colin's time tunnel, DC. I actually forgot to use Luna before killing boss life 1, so I killed life 2 with only Colin and DC. Hopefully, you're not so unlucky that Colin gives you too many dark runes to stack. Rose + Cornflower + Mysorensis + Shyplant + Merlin + Rose. What is Clay? Is that meant to be Colin? (11-25-2017, 11:07 PM)aahlsy Wrote: What is Clay? Is that meant to be Colin? >< Yeah, it's Colin. I've been listening to Chinese streams and the chinese name sounds like Clay, lmao. Somehow I completely forgot that English name was different. Fixed my post to have the right name. Cleared the Elf achievement with Sakura | Saruman | Shyplant | Tezcatlipoca | Paperwhite + Sakura. 1: Kill at least one ASAP and grind on the other two. Don't activate the buffs yet. 2: Grind. Don't activate the buffs yet. 3a: Grind, clearing weathered runes as much as possible. Don't activate the buffs yet. 3b: Saruman, Shyplant, Tezcatlipoca, Paperwhite to clear out the debuff. Burst down. 5a: Buffs will be cleared. Grind actives back slowly. 5b: Continue to grind until buffs are back. Activate everything and burst. 7a: Just spin, the Tumbler effect will keep you alive no matter how many hearts were exploded. 7b: Stack and burst. Sakura may help to remove the Dark runes. Farming now with PR Yvette | Shyplant | Yunyang | PR Nidhogg | Sun Shangxiang + Khaos. 1: Grind. You can activate Yunyang once he's up for easier spinning. 3b: Yvette, Shyplant, Nidhogg, Khaos. Burst. 4: Spin and kill. Full attacks if possible. 5a: Yunyang is cleared and reset. Grind him and everyone else back, then activate Yunyang. 5b: Sun Shangxiang to remove locked Dark. Burst. 7a: Just spin. Yunyang + Yvette's leader means you'll have no trouble here. 7b: Sun Shangxiang to convert away Dark. Burst. Achievements: Elves only, 3 or more attr. Note that not really any cards are fixed here... need 1 burst card (Merlin, Clara, Saruman, etc etc), any ally Sprites (Egg Elf). Ally Merlin is ok, but if 1st round Heart drought, good bye. 2. able to have 1 on going effect at left side before entering R5a. if no effects on the left side when enter R51, the enemy will give Heart block 5 turns. R1: spin to kill, dont stall CD here, next round instead. R2: stall till all CD up. R3b: note the burning wont go all over everywhere. just max at the outer sides. the image has different team, thats my 1st try, failed due to 'forgot' and dissolve Dark at final stage. let the enemy hit once. this is also something i dun understand. the enemy is phantom and the atk is higher than the team HP. but can survive... bug? then activate Diablo + Sprites (Egg Elf) combine skill, thats 2 effects on left side. on Merlin and Clara, 2 more effects, enough to push out the Zero Recovery. this might KO it. R4: be careful here. make sure before entering the next stage, need to have effect up. if all runes = Hearts effect is no more, can activate Yvette here for another effect. R5b: walk in the park Diablo overheal attack is not effected by Dark runes debuff. R7b: full burst with DC will KO it. even can grind it down. note that even not dissolving the electrified runes, Diablo overheal still does damage. I wanted to clear this sm with a high hp team but the 500k overheal limits most teams. Almost 30k hp. Use sagi on fire mobs to get around the earth weakness. This team can healclose too 300k hp if spin well. I took a 75% rcr craft to ensure i killed. This ultimate card is suicide on weathered and burn rds so i just get 1 copy for the diamond and harpy. Outfit even less worth the effort. 1* Clear (Light Team) with Dual Darkness + Kurapika, Marbas (can replace with other light converters), Tsang, Yi Yeh Shu and Aggressive Pique Seal for 2 turn delay in emergency. In hindsight, Marbas was a terrible idea. Bring PR PKOL instead to make the overheal stage much faster. 1, 2, 3a) Spin through, charging up Darkness multiplier. Turn on Kurapika and Darkness when ready. Also try to store some light runes. 3b) Burst with Yi Yeh Shu. 4) 2nd turn of Yi Yeh Shu. 5a) Turn on Darkness again and grind through. Turn on Kurapika when ready. 6) 2nd turn of Yi Yeh Shu. 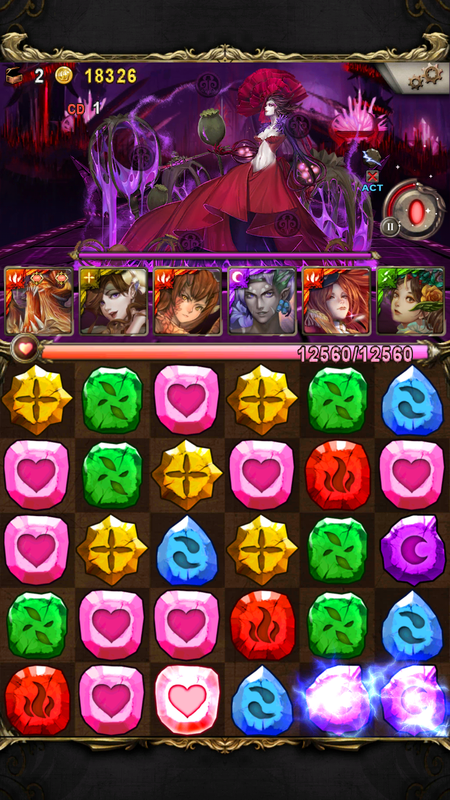 2* Clear (Elf Team, 3+ Attributes) with PR Diablo + PR Magness, Cornflower, PR Matroyshka, VR Saruman + PR Yvette. Pretty much the same as last time. 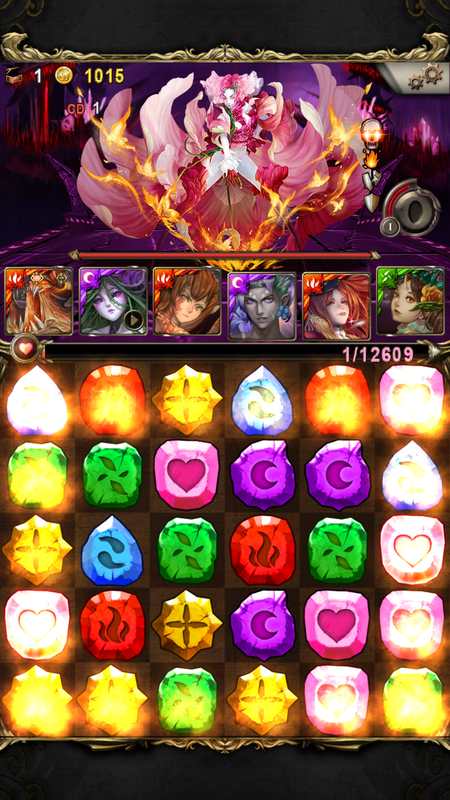 3b) Full burst with Diablo team skill, Cornflower, Matroyshka to 1-shot and push the debuff off the screen. 5a) Spin through. Use Isabel in emergency. This is a stage for kurama. Kurama shyplant daji yomi marchosias kurama but dont take/use marchosias. U need to carry the debuff 2 rounds so the later boss can cancel it. No members are required to beat thiswith kurama. 2 stars too. How do i beat the overheal stage? Manual spin! I dont think this stage is worth playing again for the third star.